Though its hard to see it among the sprawl, Jakarta is a delta city, built on the low flat floodplains of the Ciliwung and numerous smaller rivers flowing down from the mountains south of the city. Among the sprawl and smack in the middle of this floodplain sits Bukit Duri, a neighborhood bounded, and sometimes submerged by the Ciliwung river. Its a lively place with an active community center, small businesses, and neighbors from all walks of life who enjoy their shared community. The homes here are a mix of solid brick homes with brightly painted walls; and makeshift housing with little or no furniture and thin plywood walls. Its a neighborhood like many others along Jakarta’s rivers. The position of these neighborhoods hard by the banks of the Ciliwung makes them prone to massive flooding during the rainy season which in turn causes flooding in the rest of the city. Because of annual massive flooding, the Jakarta government has decided to clean up the city’s chaotic infrastructure along the riverways and other parts of the city’s jumble of informal housing. And this has meant that the residents of places like Bukit Duri who have been paying rent, paying electricity bills for decades face a very unfair situation. The government’s argument that these neighborhoods along the riverways are just makeshift squatter camps is belied by the fact that they are officially connected to the city’s power grid, and that many of the residents can show documentation of their rental payments or even ownership of their homes. And yet, the heart of this lively community has been gutted. Excavators and police descended on Bukit Duri and demolished the riverbank housing there, after forcing residents to move to low cost housing in an area far north of their former neighborhood. Small businesses and services will have to somehow rebuild in the apartment complex; no easy task if your business is raising chickens or cooking street food for your open air stall. Its clear that the government must do something to improve aging and disorderly infrastructure, and though they are improving the way they evict these riverfront communities, the result is still heartbreaking – to watch the home which provided you shelter and comfort for your entire life disappear instantly in the roar of an engine and a puff of smoke is a terrible thing. Indonesa’s coal heartland in Eastern Kalimantan was a hub of big money activity during the global commodities boom of the first decade of the 2000’s driven largely by coal and palm oil output. Big housing projects, glitzy malls, even an amusement park were built during the heyday as coal continually reached new highs over the decade. But as the boom came to an end, the region has experienced a huge loss of employment and many of the plans made when prices were reaching their peak have been put on hold or have been made obsolete by the new economic dictates of an era of sharply lower commodities prices. I travelled there to see the contours of a place shaped by asset bubble dynamics. These are Burmese fishermen, the last dozen or so of the thousands who were enslaved by unscrupulous Thai fishing boat owners and forced to work 18-20 hours a day for a promised monthly pay that they never saw. Fear and intimidation by crew supervisors kept them working and from running away. Beatings with iron bars or stingray tails, burns with scalding motor oil, and in some extreme cases, murder were witnessed or experienced first hand by most of these men. In 2015 an investigation by The Associated Press, led Indonesia, in whose waters most of the slavery was happening to halt commercial fishing activities. Hundreds of commercial fishing boats anchored in ports around Eastern Indonesia and there the scale of the slave trade was revealed. Thousands of men poured off the boats with horrific tales which thanks to the Indonesian government and the International Organization for Migration (IOM) and the AP can now no longer be ignored. I met these men while working with IOM which has been helping the Indonesian government care for the fishermen while they are waiting for government forced negotiations over their pay to conclude. But many of their colleagues left without any pay at all because they simply wanted to go home, and those that waited often had to accept a mere pittance for their years at sea. For 30-40 dollars a month Sunita rents a small dark and airless room crammed in amongst dozens of others underneath a highway bridge in central Jakarta. Many of her neighbors have been living there for nearly 10 years, and many work for the city government as street sweepers. Several months ago they were told that they would have to leave, though most cannot afford the 70-80 dollars/month or more it would cost for a small and cheap but legitimate apartment. Just a few days ago all of the residents under the bridge were evicted and their makeshift housing destroyed. It’s a never ending struggle. 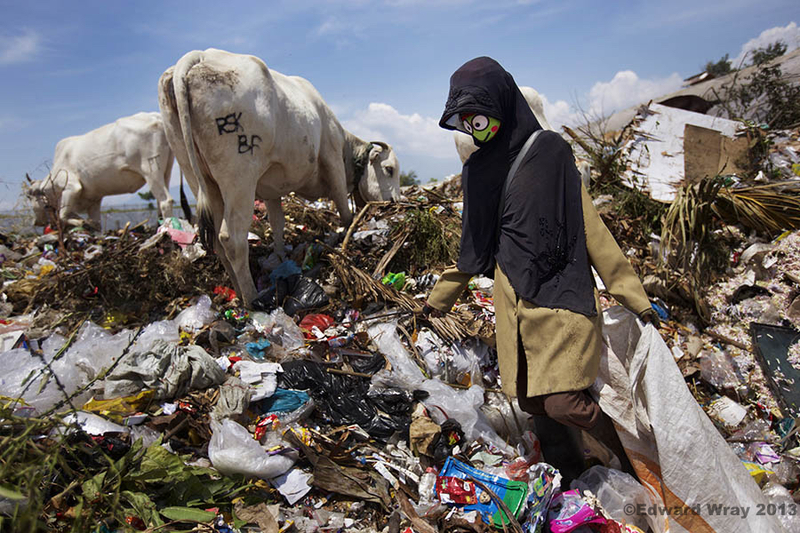 Thousands of impoverished Indonesians come to the capital every year to find opportunities that don’t exist in their home towns where farming is generally the only way to scratch out a living. But, Jakarta itself isn’t prepared for the onslaught and arrivals from the country often have to make do with whatever shelter they can scrounge up in unused public spaces alongside railroads and rivers and under bridges. The clash between the need to clean up Jakarta’s perennially flooded infrastructure and the shortage of low cost housing results in those with the least resources getting shuttled from one inadequate housing situation to another. I grew up in a mountain area and so have always loved mountains. The quiet, the cold, the solitude, being so close to the clouds has always left me feeling good, so I was really glad to have taken a quick trip to the Bromo volcano and come across the Tenggerese people who live there, up among the cloud banks coming up from the valley and the sulphurous smoke from the Bromo volcano in East Java. They are living history, the remaining descendants of the once wealthy and influential Majapahit kingdom. It was the last Indonesian Hindu-Buddhist Kingdom before the rise of the Muslim Sultanates which pushed the Majapahit East from Central Java in the 15th century, the majority of the royal court, courtiers, artists fleeing to Bali. I love watching volcanos. Its a wonder to see the earth remake itself, a process that is continual though rarely this dramatic or dangerous. As beautiful as the sight is, eruptions are terribly dangerous and disruptive to the lives of thousands who live on the shoulders of volcanos. In this case, it is the Sinabung volcano in Karo, North Sumatra, Indonesia. 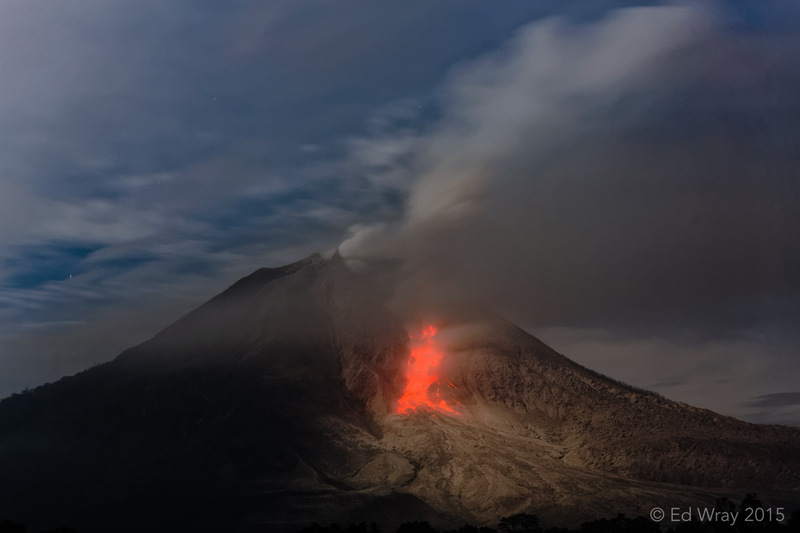 It had been quietly sleeping in Karo since 1600, coming to life again in 2013 when it began its current eruption cycle. 16 people were killed in 2014 and as I write, thousands are living away from their homes in refugee centers and are unable to properly tend their crops. I hadn’t yet had a chance to come and see this volcano having been busy with other projects and assignments, but made some time to watch it erupting until last week. I just caught the tail end of an active cycle and made just one frame the night before I left. I hope to make it back when it becomes more active again. On a recent trip to Indonesia’s Madura Island, I saw this little corner of the island where Madurese practice one of the things they are justifiably famous for, breaking down and selling scrap. When you can get up in the morning and go to your demanding and unpleasant job and make the effort to put a “Kermit the Frog Smile” on your face, you definitely deserve a better job. from a recent assignment in Aceh -It could very well have ended up a ghost story. Thousands of souls from the oppressed Rohingya minority in Myanmar and impoverished Bangladeshis doomed to sail the seas in failing boats with limited supplies of food and water with no country willing to accept them; their cries and suffering absorbed by the elements. Thankfully Indonesia and Malaysia have stepped up and said that they will accept them on the condition that they be placed in third countries within a year. I sincerely hope that countries signed on to the UN Convention on refugees take their promises seriously. These people have been through enough.